Include 100% of the work necessary to complete the goal. Don't account for any amount of work twice. Focus on outcomes, not actions. A work package should take no less than 8 hours and no more than 80 hours of effort. Include about three levels of detail. Assign each work package to a specific team or individual. It’s your first dive into the world of project management and everyone around you seems to be speaking Chinese. Worse than anything, your co-workers hurl acronyms left and right, and there’s not enough time for you to look one up before a new one is casually tossed onto the field—QCD, PMBOK, ACWP, QFD, RBS, SOW, SWOT, FPIF, and WBS. 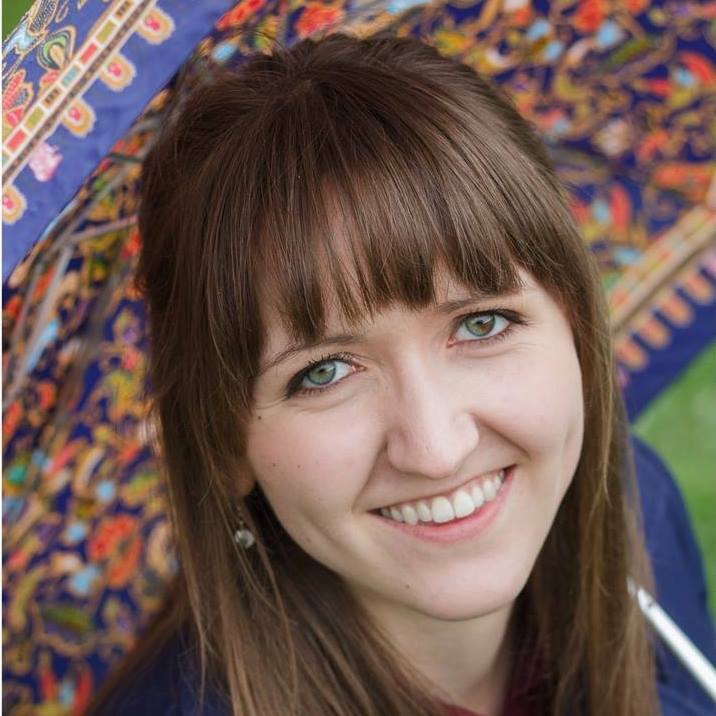 Why use a WBS in project management? Estimate the cost of a project. Determine a project timeline and develop a schedule. Write a statement of work (or SOW, one of your other acronyms). Assign responsibilities and clarify roles. All of these benefits essentially arise from working with chunks of a project that you can accurately visualize rather than trying to digest and interpret a mysterious and overwhelming task in one fell swoop. To start, record the overarching objective you are trying to accomplish. This objective could be anything from developing a new software feature to building a missile. Next, divide the overarching project into smaller and smaller pieces, but stop before you get to the point of listing out every action that must be taken. Remember to focus on concrete deliverables rather than actions. Depending on the nature of your project, you may start dividing by project phases, specific large deliverables, or sub-tasks. The 100% rule. The work represented by your WBS must include 100% of the work necessary to complete the overarching goal without including any extraneous or unrelated work. Also, child tasks on any level must account for all of the work necessary to complete the parent task. Mutually exclusive. Do not include a sub-task twice or account for any amount of work twice. Doing so would violate the 100% rule and will result in miscalculations as you try to determine the resources necessary to complete a project. The 8/80 rule. There are several ways to decide when a work package is small enough without being too small. This rule is one of the most common suggestions—a work package should take no less than eight hours of effort, but no more than 80. Other rules suggest no more than ten days (which is the same as 80 hours if you work full time) or no more than a standard reporting period. In other words, if you report on your work every month, a work package should take no more than a month to complete. When in doubt, apply the “if it makes sense” rule and use your best judgment. Three levels. Generally speaking, a WBS should include about three levels of detail. Some branches of the WBS will be more subdivided than others, but if most branches have about three levels, the scope of your project and the level of detail in your WBS are about right. Make assignments. Every work package should be assigned to a specific team or individual. If you have made your WBS well, there will be no work overlap so responsibilities will be clear. 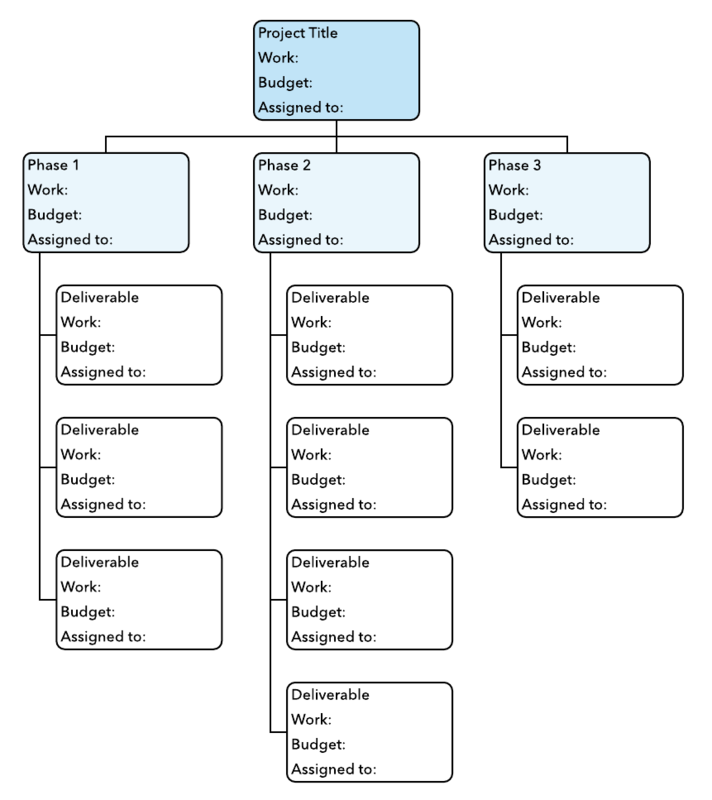 As you are thinking about how to make a work breakdown structure, let’s look at an example. This is a work breakdown structure for building a house. Notice how the rules of building a WBS are applied in this example. First, the house building project is subdivided into three large sections that seem to make sense: foundation, exterior, interior. Those sections are further subdivided to one or two more levels for a maximum of three levels. The effort needed to build a house has been allocated across all of the work packages for a total of 100% effort. There is no duplication of work represented in this diagram. 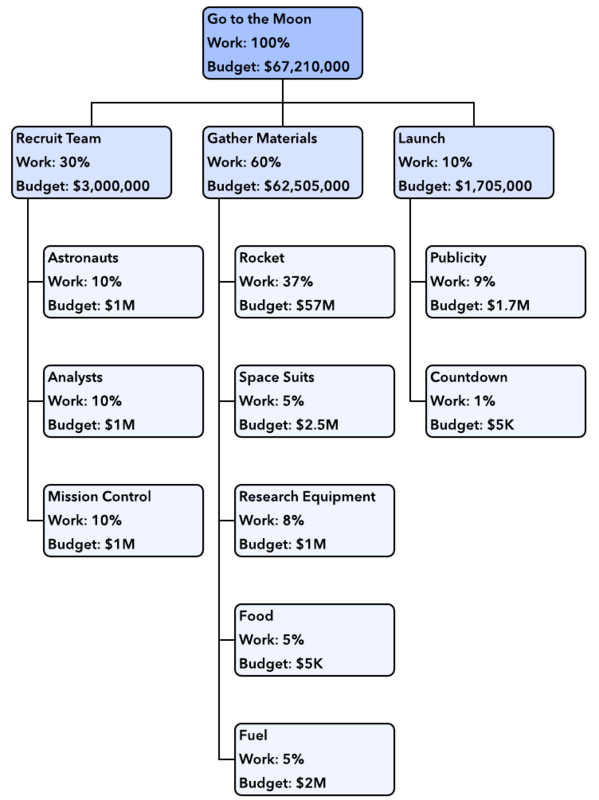 To further enhance this diagram, it would be possible to add the budget for each work package and assign a team. 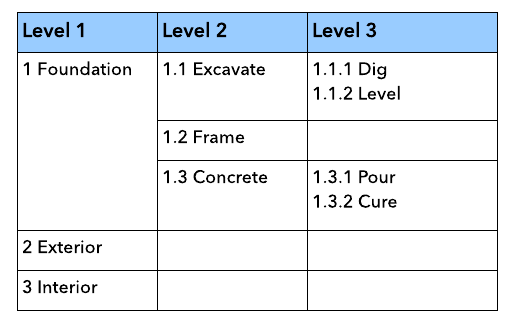 You can choose from several different format options when creating a work breakdown structure. The example above uses a tree format, which is the most visual option. It structures the WBS like an org chart and shows the hierarchy of tasks in addition to providing space for additional information about each work package. A text outline is the simplest WBS format. It is easy to put together and shows the hierarchy of tasks. However, it is difficult to add additional information about budget, duration, and assignment using this format. This format is less visually intuitive but shows the hierarchy of tasks. Because it is a table, this format fits easily onto a page. A tabular view is a more visually intuitive way to show hierarchy using a table. What is a WBS dictionary? A WBS dictionary is formatted like the hierarchical structure, but it includes a brief description of each work package. 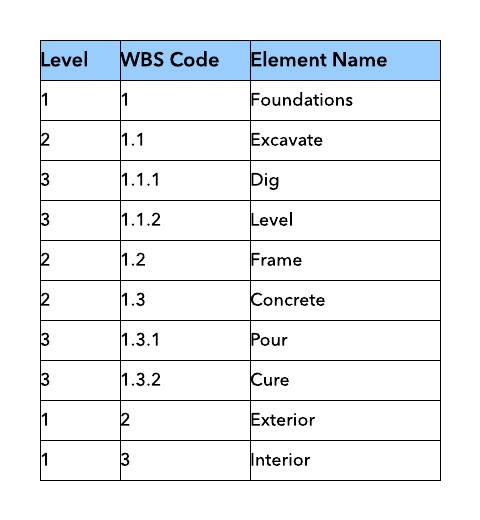 When documenting a project, a WBS dictionary is often included in addition to a visualization of the WBS. It helps to clarify the scope of each task so that all team members understand their responsibilities. 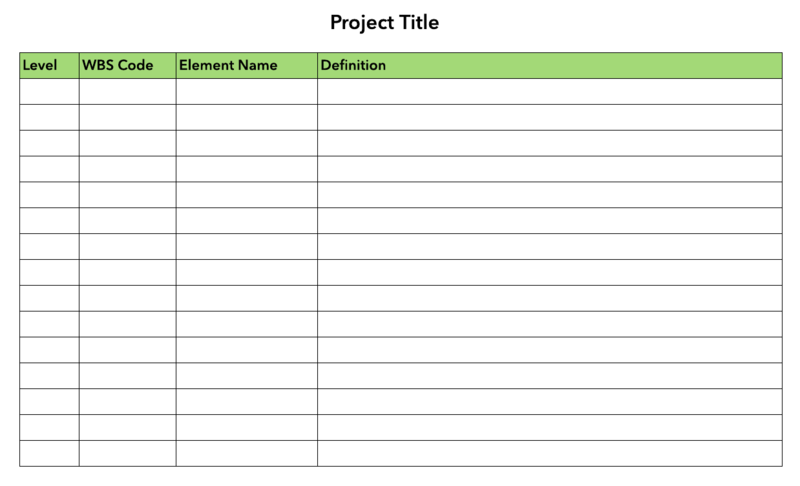 To get you started, here are a number of work breakdown structure templates you can use. Simply click to open the template, and then customize the information, layout, and design. 1. Register for a free account with Lucidchart. 2. 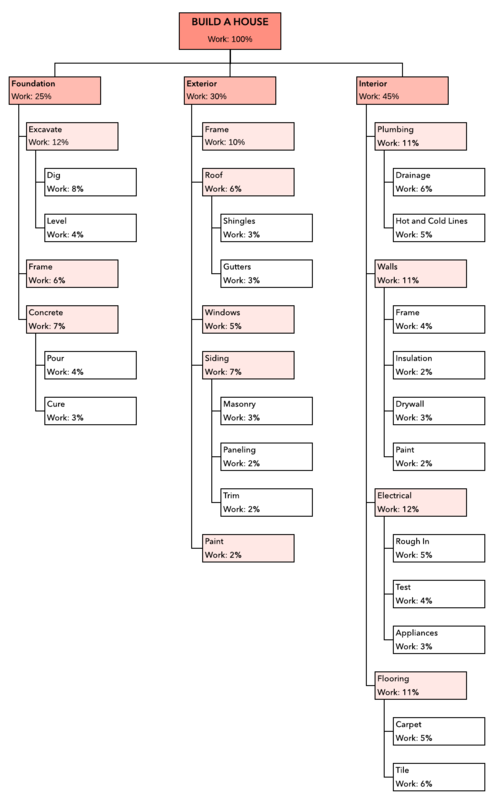 To make a work breakdown structure in Excel, install the free Lucidchart add-in for Excel. 3. Install the free Lucidchart add-in for Word to create a WBS in Word. Love the WBS method? Tell us your WBS success stories in the comments below!